For larger pups or pups who really love to chew, it can be tough to find a dog chew that will stand up to all that aggressive chomping. 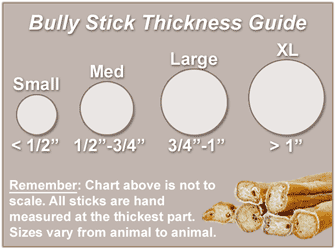 That's why we made our 7" Straight Bully Sticks for dogs in an XL thickness: to accommodate even the strongest chewers! Made of delicious, all natural beef muscle, we carefully roast each bully stick in its own juices to soak up all of that irresistible natural beef flavor. The end result? A tasty, long-lasting dog treat your pup will absolutely love!